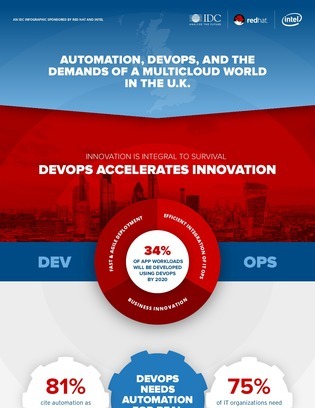 Automation, DevOps, and the Demand of a Multi-Cloud World in the U.K.
DevOps has been adopted by many organizations and is considered the go-to development model for increasing productivity and higher customer satisfaction. But if automation isn’t playing a large enough role in your DevOps strategy, you could be losing out on even stronger performance. 40% of organizations recently surveyed said automation has reduced their IT and infrastructure costs. Take a look at this infographic to find out how Red Hat can help introduce automation to your DevOps processes and other improvements you can make.